Jo Anne Valentine Simson, retired biomedical scientist, is reinventing herself as a writer (although that has been a secret vice for much of her lifetime).A wanderer at heart, she lived overseas for five years and delights in human cultural diversity. She was one of several contemporary scientists featured in a Smithsonian exhibit, Science in American Life (1994 – 2011, National Museum of American History). With a PhD in the biomedical sciences, her non-scientific writing is analytical, and it often addresses human irrationality. She is keenly interested in the jagged interface between science and the rest of human culture. Since retirement, she has traveled extensively and has blogged about several of the trips. Besides many scientific papers, Dr. Simson has published three non-fiction books (as J.A.V. Simson) as well as a few short stories with the pen name V. Pascoe. Stay up to date on JAV Simson’s Writing Life. 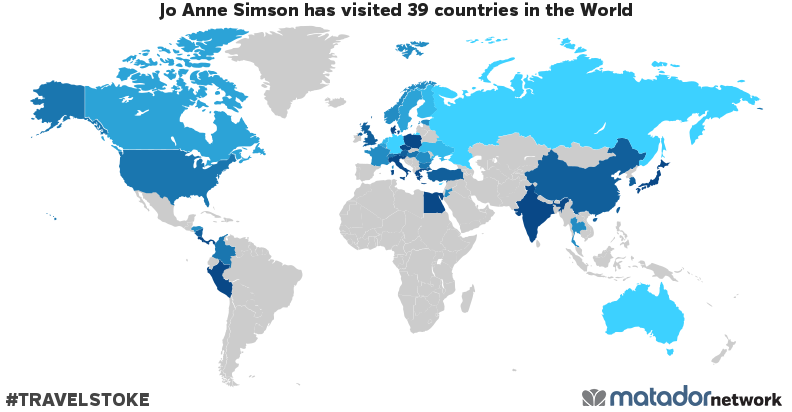 Jo Anne Simson has been to: Austria, Australia, Belgium, Bulgaria, Canada, Switzerland, People’s Republic of China, Colombia, Costa Rica, Cyprus, Czech Republic, Germany, Denmark, Estonia, Egypt, Finland, France, United Kingdom, Greece, Honduras, Hungary, India, Italy, Jordan, Japan, South Korea, Nicaragua, Netherlands, Norway, Panama, Peru, Poland, Romania, Russia, Sweden, Thailand, Turkey, Ukraine, United States.